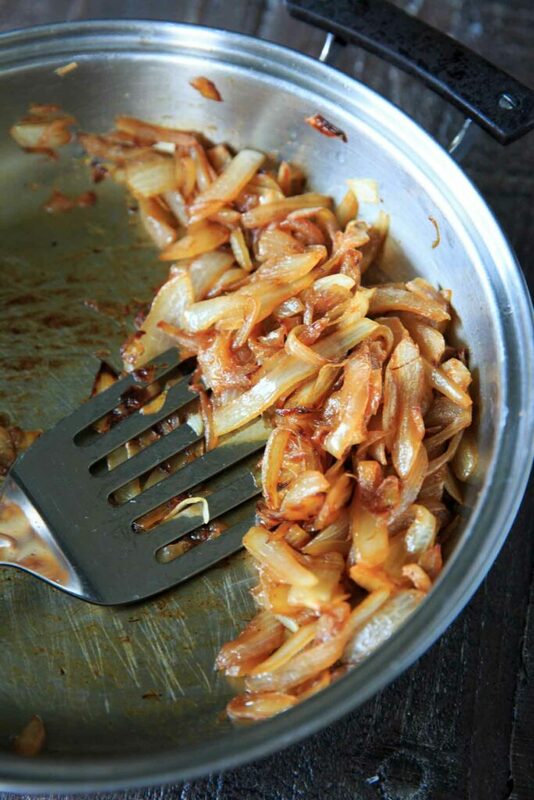 How to easily make caramelized onions for a sweet flavor addition to many dishes. A little time and patience is needed, but the payoff is worth it! 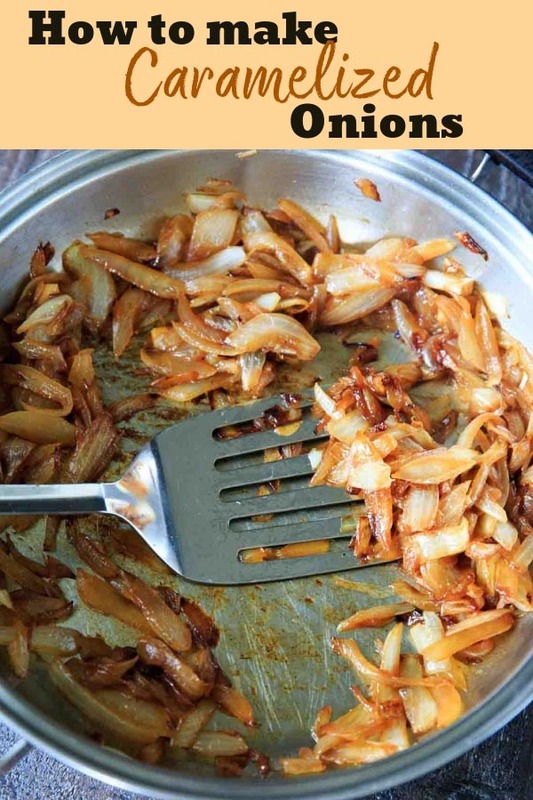 I’ve had some misconceptions about caramelized onions – and when I finally learned how to make them, I wanted to share my tips with you! 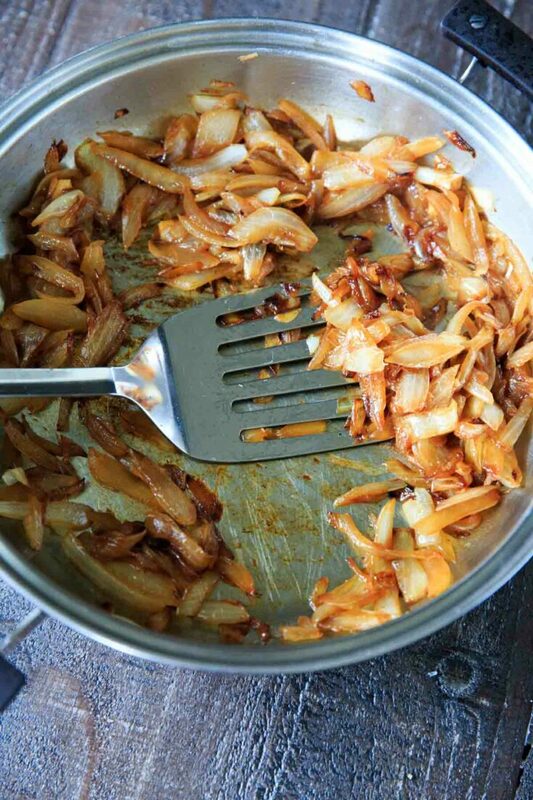 First, why make caramelized onions? Because they are so versatile, and add a wonderful sweet flavor addition to dips, casseroles, soups and even pizza. The next question you may have is what kind of onion do I use? 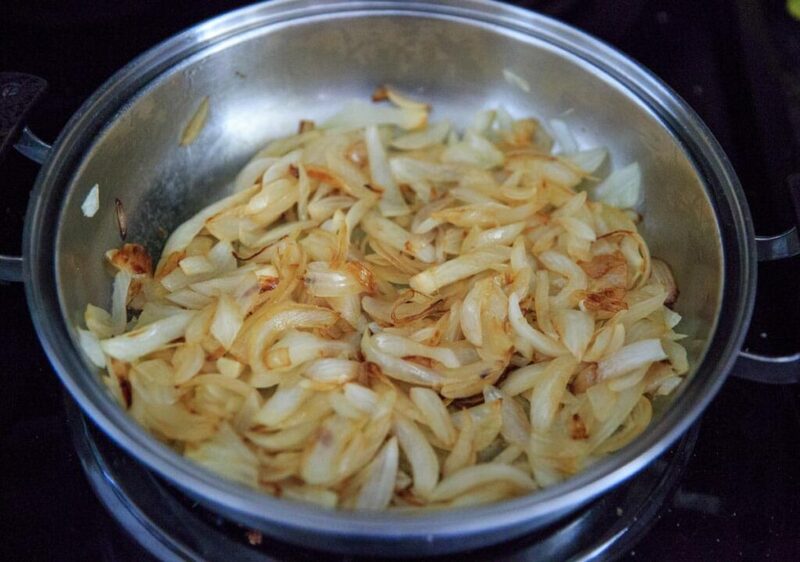 I find yellow or white onions caramelize the best, but you can try this with any kind. As for the ingredients you’ll need to make caramelized onions: butter, oil, onion, a dash of sugar (optional) and a pinch of salt. While you can make caramelized onions with only one of either butter or oil, the best result will be if you use a bit of both. If you have to choose just one, choose a high quality oil (extra virgin olive oil or avocado oil). Cooking in only butter may burn the onions too quickly because it has a lower smoke point. Combining the higher smoke point of a good quality oil plus the flavor of a little butter fat is the best! 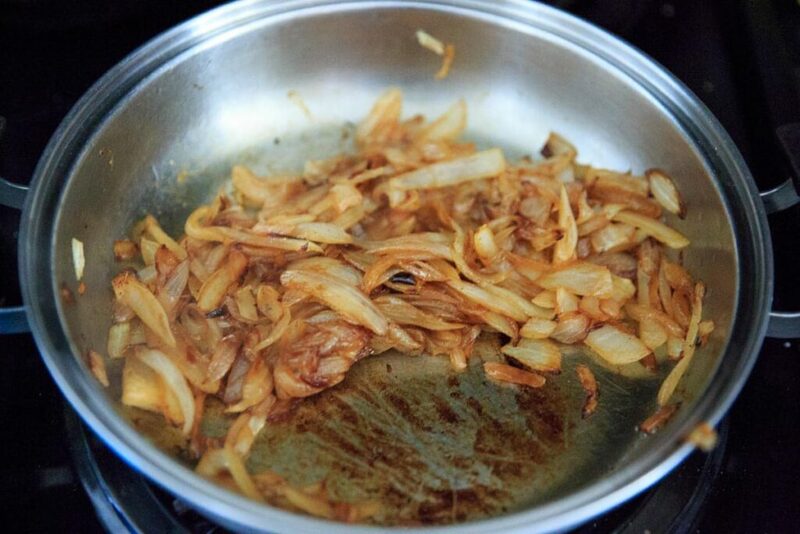 You should know, there are several stages of caramelized onions. To get them a deep golden brown color, takes time and patience. Really. I find it best to have something else you’re doing in the kitchen at the same time, so you’re not just staring at onions for 45 minutes! Heat your butter and oil on medium low heat and don’t touch the heat setting until you’re done. Add the onions and a pinch of salt. Stir occasionally, but not too often. Try to stir every few minutes. You want to let the onions sit a bit so they will soften! If the onions start to burn, add a little bit of water. Add a dash of sugar if you want to speed up the process a little bit. Keep going until they are a nice golden brown. You want to slice the onions, not chop or dice. Don’t slice them too thinly! The thinner the onion, the quicker they cook – and burn! Since this process takes a bit of time, you don’t want them to overcook. But DO slice them evenly. Nothing worse than part of the batch burning while part is still not finished cooking. Don’t crowd the pan. If you are doubling the recipe or using a lot of onions, use a large pan and make sure they all fit while mostly touching the bottom of the pan. PRO TIP: For even more flavor, don’t forget the deglazing step! After the onions are done cooking, add a bit of liquid (water, wine, stock, vinegar – choose something that matches the flavor of your final dish) and stir into the onions. This will help the onions soak up all the remaining caramelized bits on the bottom of the pan! 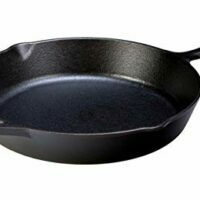 In a medium-large stainless steel or cast iron skillet, melt the oil and butter over medium-low heat. Add the sliced onions, sugar (if using) and salt and stir every few minutes. Continue to stir every few minutes until a rich golden-brown color (about 40-50 minutes). Sugar is not necessary but will help speed up the caramelization process a little bit. 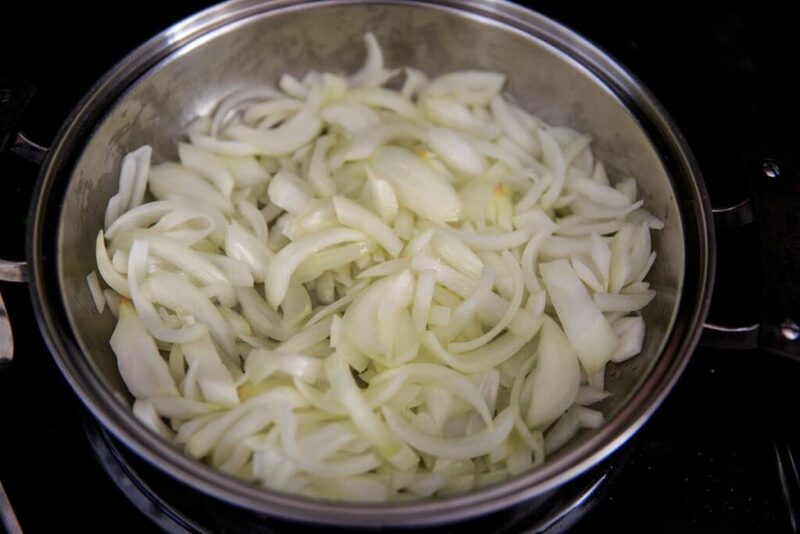 If the onions start to burn during the cooking process, add a little water to the pan. PRO TIP: After onions are finished cooking and pan is still hot, "deglaze" by add a little liquid to the pan (water, vegetable stock, wine, vinegar - something that will match the flavor profile of your final dish) and stir in with the onions to help absorb all the flavor left at the bottom of the pan.